The penny loafer garnered its name from teenagers in the '50s keeping their payphone change in the front lip of their classic shoes. And to this day, the original smart-casual hybrid remains a design icon. Handcrafted in Northamptonshire, England, this burgundy calf-leather version is finished off with a studded Goodyear rubber sole which will last a lifetime. However, your loose change can now stay in your pocket. 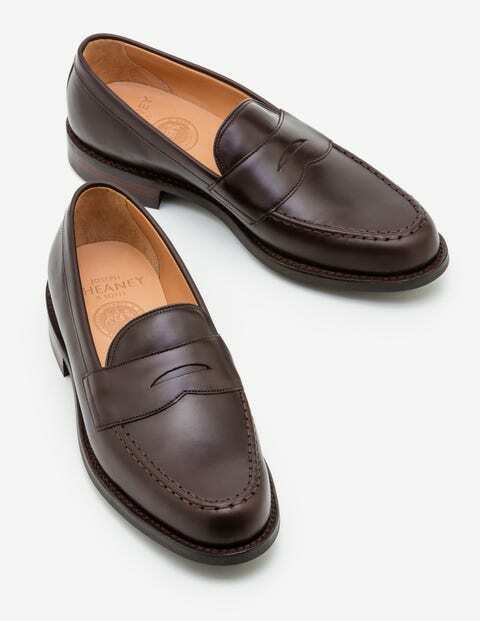 These shoes are expertly crafted in the UK by Cheaney and come in UK sizes. Customers should refer to the size guide for an accurate comparison to US and EU sizing.